Governor Branstad talks about the new state strategy on water quality. State officials today unveiled a “strategy document on water quality” that seeks to address farm practices as well as urban facilities owned by cities and businesses that have run-off that winds up in Iowa waterways. Iowa Agriculture Secretary Bill Northey says it outlines “meaningful” steps that will improve water quality in Iowa and downstream. John Lawrence, director of Iowa State University Agriculture and Natural Resources Extension, says a team of scientists examined how landscape changes in farm fields help prevent nitrogen and phosphorous run-off into rivers and streams. Lawrence cites strategies like reduced tillage of farm ground, so there is plant material left behind after harvest to keep soil in place as well as adherence to recommended application rates for farm chemicals — a process made easy with the GPS technology now installed in many pieces of farm equipment. But the proposed state-led effort to improve water quality goes beyond farming and addresses practices in businesses and cities that can contribute to water pollution. Iowa Department of Natural Resources director Chuck Gipp says it became clear all parties that have the potential to pollute should be addressed by the plan. Governor Branstad stresses the voluntary nature of the plan. The “Iowa Nutrient Reduction Strategy” has been posted online — find it here — and there’s a 45-day period for Iowans to submit comments about the plan. Gipp disputes published reports suggesting the document has sections copied directly from Iowa Farm Bureau proposals. Gipp also says the state is working with the Environmental Protection Agency to address concerns about state enforcement of water quality regulations. 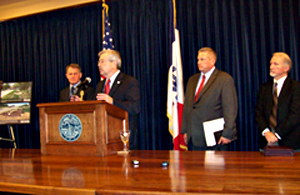 Gipp, Branstad, Lawrence and Northey made their comments this morning during a news conference in the governor’s office.